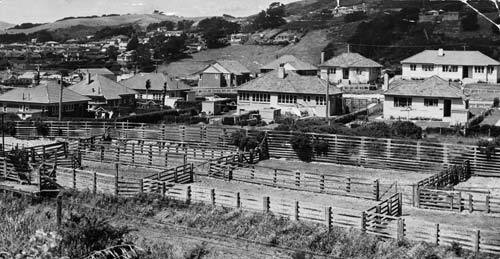 In the 19th century, Johnsonville developed as a service centre for a growing rural population. These sale yards were built around 1894 in Broderick Road. Residents soon complained about the lack of hygiene and stock being driven through the streets. But the yards remained a local fixture until the middle of the 20th century, when the town’s rapid growth forced their closure. This 1946 image was taken shortly before then, with new state houses in the background.